78-year-old Durham-based science writer ALBERT SIMPSON is the author of a new science book ‘Energy is Everything’ Albert argues that humans just like the protons, neurons and electrons of which they are made, are designed to gather energy and that is why we have evolved. OUR universe is one of energy that never dies. That is the first law of energy. The second law is that energy spreads itself ever more thinly. However, to spread something more thinly you have to first collect it. Earth’s humans and all other animal life forms; all plants and fungi; all bacteria and all non living structures, indeed everything on earth is composed of proton, neutron and electron particles. Think of those particles as energy machines that process energy. They seek out, collect and process suitable energy packets dispatched by other particle energy machines. Those dispatches are near same energy totals but of changed energy packets. On earth such particles occupy less than 0.00001% of space which is why in outer space the densities of neutron stars and black hole cores can be millions of tons per cubic centimetre. All particles constantly vibrate in response to their energy collections and releases. Energy exchanges between particles in structures determine where the particles are located in those structures and how strongly they are linked to one another across the considerable spaces between them. Atoms, molecules and compounds are all just energy efficient particle arrangements in space. They are the building blocks that link to one another in earth’s solid, liquid and gas structures. Why is the above of human interest? Because the desire of particles for energy is the reason we evolved. We evolved senses to see, feel, hear, smell and taste; the means to move about the earth; brains able to store and process the information received by our senses and the means to repair and reproduce ourselves. It was all done so our particles could better collect energies. We are fundamentally highly sophisticated mobile energy gatherers. Think about the level of cooperation there must be between the particles in your body cells and how such cells then cooperate in your brain, nervous system, circulatory system, digestive system, muscular system, reproductive systems and endocrine system, etc. The estimated 3,700 trillion, trillion particles of our bodies cooperate as they do because they all benefit from our energy collecting. Such phenomenal levels of particle cooperation must surely mean that the energy packet transfers between particles are a means of communicating. Observe how plants grow. Seeds collect energy from the soil and build energy structures that reach up seeking best positions from which they can more efficiently collect the energy of the sun. They process that energy and store it in their growing structures. Plants are all about satisfying their particle energy needs. Without their evolution the evolution of animal life forms, that rely heavily on plant energies, would not have happened. Each human is the host to parasitic bacteria cells that outnumber body cells. They are each a smaller, simpler energy gathering cell structure evolved from cells that first existed, on the now 4.5 billion year old earth, about 4 billion years ago and in an atmosphere rare in oxygen. They are thought to have consumed amino acids and sugars dissolved in water so as to get their energy needs and to have created nucleic acids capable of replication. Were these early forms of bacteria the first to gain an energy gathering advantage over inanimate particle structures which rely entirely on their vibrating particle motions to seek out and gather in surround energies? Earth’s orbital motion toward the sun, regarded as a gravity pull, is simply the net vibratory motion of its mass of particles to collect the energies coming to earth. You may not expect it but the sun’s particles similarly collect energy from space. Such gravity collections are essential to and control the scattered fusion processes in its core. They convert hydrogen structures into more energy efficient helium particle structures, releasing much energy. A square centimetre of earth particles in full sun are estimated to collect one million trillion energy packets called photons every second. Those higher energy packets are spread by particle energy exchanges in all directions throughout the earth and, between its surface structures. They become lower energy packets in the process and more likely to curve to attracting particles. The low energy exchanges that sustain structures are often referred to as virtual photons. Nearly all earth received energy goes back into space as more numerous lower energy packages. Einstein saw no gravity force. His general theory of relativity described what we perceive as gravity as due to the curvature of space and time. Massive particle structures influence spacetime whilst spacetime delivers motion to massive particle structures. Think of spacetime as all those photon energies travelling at light speed through space intent on reaching some distant particle. They are influenced by the energy desires of massive particle structures that move to collect energies. The desires of particles for energy are why starlight bends around our sun and why visible light energy photons are unable to leave black holes. Gravity is about particle desires for energy. Fractions of a second after the big bang that sent energy out into the universe neutron particle energies started becoming proton and electron energies. In atoms we find protons and neutrons in its nuclear centre and the more mobile electrons considerable distances away. We might wonder if that was a deliberate intent on the part of neutrons to evolve as improved collectors and communicators of energy. You have to wonder if the limited range strong nuclear forces said to hold neutrons and protons in nuclei are just vast numbers of low energy photon exchanges that seriously curve between proton and neutron particles. We might also wonder if protons process the energies received from the highly mobile, space dominating electron energy gatherers so as to make them more suited to neutron needs. Humans are undoubtedly superior energy gatherers and could now easily produce food energies to meet the world needs. You might think that we would be more relaxed like our pets. Instead we seem the most stressed of life forms. Those with most want more, whilst those with least get less. We seem unable to shake off the aggressive and competitive behaviours needed in the past when control of energy sources meant life or death. What a shame we humans cannot cooperate with other humans in the way that our body particles cooperate within us. What a more relaxed and better world it would be. In life we can make a point of better understanding and supporting the energy needs of our body particles so that they better contribute to our well being. We can seek to be more in tune with the energies of the world around us and thereby lead a more fulfilled life. In death our particle energies do not die. Often their structures immediately appear more relaxed than they did in life. Particles simply start to rearrange themselves in new structures. Our energies living forever must surely be a far better thought than the biblical “dust to dust” end. 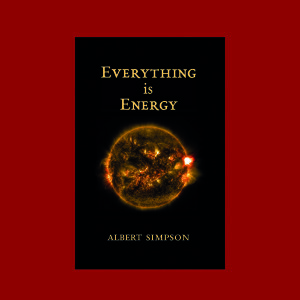 Albert’s book ‘Everything is Energy’ is priced £7.95 and published by Cosphi Publications. It is available online from http://tangledworm.com The book is one of words and diagrams and is designed to make you think.